The basketball-themed installment of Microgaming's 'Sport Star' series features five reels and an unbelievable 243 ways to win while playing, basically pushing the pay lines to almost any possible combination. 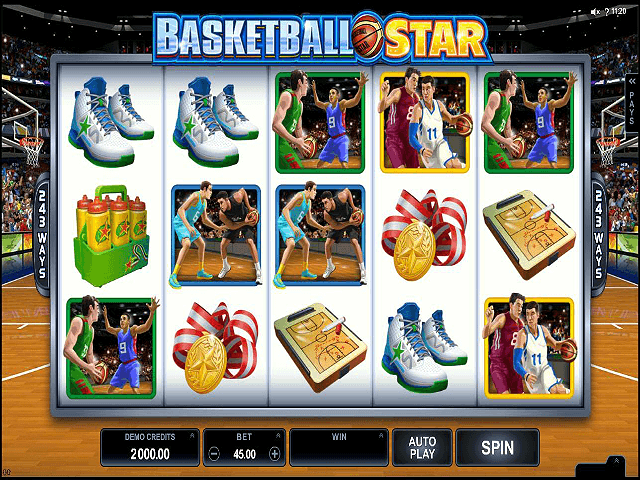 Players enjoying Basketball Star online slot will find a bevy of basketball-based symbols used to represent the generous bonuses the gameplay offers. The 2D graphics bring most players back to early video game nostalgia while the up-to-date features pull players back into the modern slot game world. Read on to find out more about this staple in the 'Sport Star' series! Basketball Star brings the sights and sounds of the American game to your living room – or wherever you want to play. It's part of Microgaming's Sport Star series alongside the likes of Rugby Star, Football Star and Cricket Star. On a stylistic level, the five reels with their 243 ways to win are set atop a basketball court where the crowd cheers you on as you spin. When it comes to payouts and symbols, Basketball Star is, as you'd expect, all about players, balls and winning tactics. From players putting moves on their opponents to drinks bottles and strategy diagrams, this online slot is full of basketball-related images. In some respects, the overall design of Basketball Star is slightly retro and might look a little too simplistic for some players. However, if you stick with it, you'll see it really kicks into life when you hit a win! Unlike a game of basketball, you don't have to wait for the tipoff to set the reels in motion. Instead, this game requires you to set your bets using just one variable: the "bet" option. Depending on the size of your bankroll, you can play Basketball Star from as little as 0.50 credits or as many as 50 credits. Depending on the amount you stake, payouts in this game can range from 0.02 credits at the lowest level to a whopping 120,000 credits at the top of the shop. 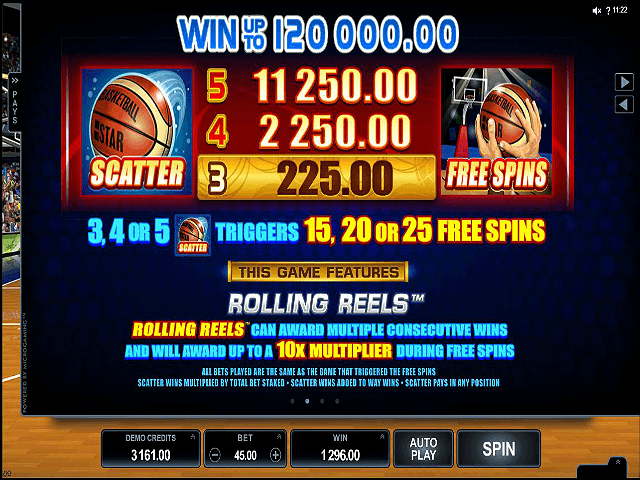 In fact, if you can slam dunk five scatter symbols on the active win lines, you'll not only get 12,500 credits, but 25 free spins and a 10X multiplier. 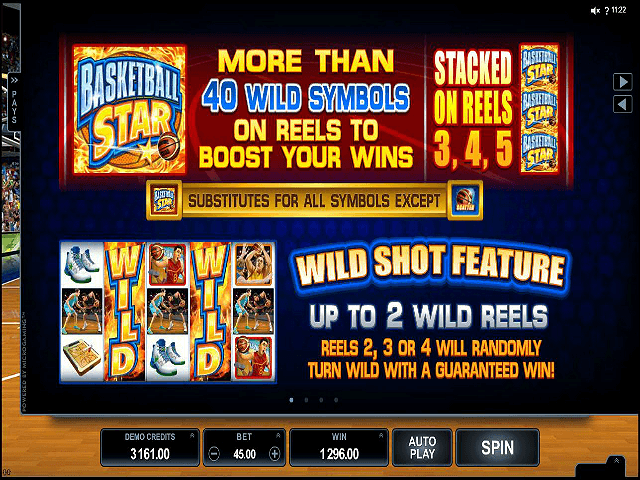 As well as free spins and multipliers giving you a chance to wow the crowd and take home some serious prizes, Basketball Star shines for two reasons: wild and collapsing wins. Because of the way this online slot game has been designed, you can roll in as many as 40 wilds on a single spin. In real terms, this means you can turn nothing into something sizeable with ease. Beyond the stacked wilds feature, Basketball Star offers a collapsing wins dynamic. As we hinted at earlier, despite the slightly simplistic look of the game, it comes to life when you spin a win. After the symbols have aligned and the credits been added to your balance, a halo of fire will engulf the symbols and – in a puff of smoke – they'll disappear. Once the symbols have been removed from view, a new set will take their place. If the new symbols help to create a win, you'll not only get more money added to your account, but the process will repeat itself. Basically, if your luck is in, a single win could turn into something a lot more impressive thanks to this dynamic. In fact, if there's one reason to play Microgaming's Basketball Star, it's because one bet could change your fortunes. 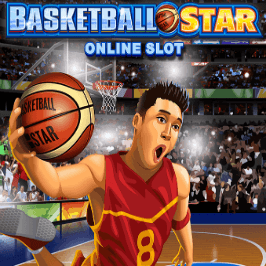 Overall, if you're someone who enjoys online slots with a simple structure but an entertaining theme, Basketball Star is for you. Although it's not as intricate as some of its peers, the special symbols and collapsing wins make it one that's capable of turning even the smallest bets into something truly impressive! 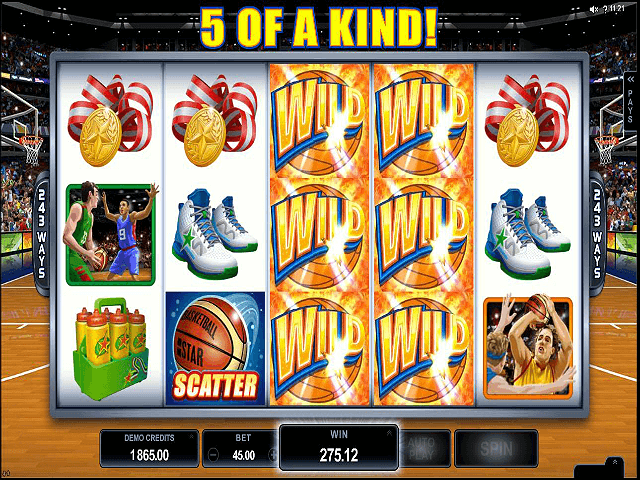 If you like Basketball Star - You'll like these slots too!